Logging with various supporting cable systems in the mountains and on steep slopes will be of great importance in the future. When used correctly, this technique guarantees an environment-friendly logging process. To meet the changing practical requirements, the corresponding training of staff must keep pace with technological progress. The Franz Mayr-Melnhof-Saurau Forest Estate covers a total acreage of approximately 32 000 ha (1 ha= 100 metre × 100 metre = 2.5 acre). It is the biggest privately owned forest enterprise in Austria. The forests are situated in a mountainous region, thus the slopes are rather steep with a mean gradient of 60 percent. The altitude varies between 430 m and 2 200 m. The forest stands reach up to 1 750 m.
The construction of roads began shortly after the Second World War. Today the private road network has a total length of 1 300 km, which means a road density of 42 m per hectare. Road construction is continuing. The annual production is about 150 000 m3 round timber, 90 percent of it from conifers (mostly spruce) and 10 percent from broad-leaved species. Sawlogs are delivered to the enterprise's sawmill, where 1 million m3 of round timber are processed annually. Until 1974, felling, branching and bucking were carried out entirely by power-saw methods. Rising manpower costs and a certain shortage of forest workers were the reasons for buying a Swedish processor in 1974. Furthermore, a second, bigger processor (MM 800), was developed in the company's mechanical workshop in 1978. 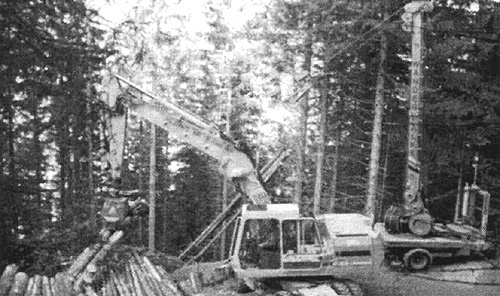 Both machines were operating on the forest road. 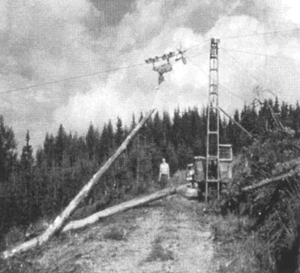 They were used for branching and bucking the trees out of clear-cuts delivered to the roadside by the cable yarder “Hydrokran”, either in uphill or downhill direction. Later, thinning operations were mechanized as well by using the smallest cable yarder “Wanderfalke” and the small-wood processor “MM 400”, all machines being developed and built in our workshops. In 1983, fully mechanized timber production had reached a maximum of 47 percent of the annual cut. Since then, to compensate for the rapidly rising machine costs, the use of processors had to be reduced. More and more of the logging was turned over to contractors and local farmers, who at that time were comparatively inexpensive. In 2000, only 41 percent of the annual cut was harvested by the company's own workers and 59 percent by contractors and farmers (see Figure 1). Now even the contractors have to worry about where to recruit their workers and are improving fully mechanized methods. Particularly in thinnings, full trees are yarded to the road by cable yarders and then branched and bucked by processors. The cable yarder, as well as a knuckleboom loader, are mounted on a truck. The processor head is fixed on the loader's boom (see Photo 1). Two men - feller and chokerman - work on the cut, and the operator on the road handles the yarder as well as the processing unit. With the aid of the loader, he also stores the bucked timber for further transport. Operating both machines with one single driver is possible only by using the steering device, “Automatic Target Control”. Photo 1. Truck with cable yarder system and loader mounted on. With that device, the distance from the landing to the loading zone can be programmed. After starting the carriage by a push-button, it runs to the pre-set point and stops there automatically. If a support has to be passed by the carriage during the run, the speed is automatically reduced before reaching the support and accelerated after passing it. When stopped at the loading point, the chokerman takes command. Meanwhile the yarder operator is able to branch, buck and store the trees yarded previously. In this system, the yarder and the processing unit are mounted on different carriers. After yarding, most of the trees have to be moved and stored by a tractor along the roadside. An advantage of this system lies in the ability to use a single processor for handling the output of up to three yarders. This selection process has been carried out for many years and has resulted in the formation of a group of “core enterprises”, which - like the company's own operations - has to be included in the annual plans. The company knows which work is done well by which firm, and out-sources it to regular contractors accordingly. In a high percentage of cases, agreement on the price can also be reached. It is the exception that other companies have to be contacted. 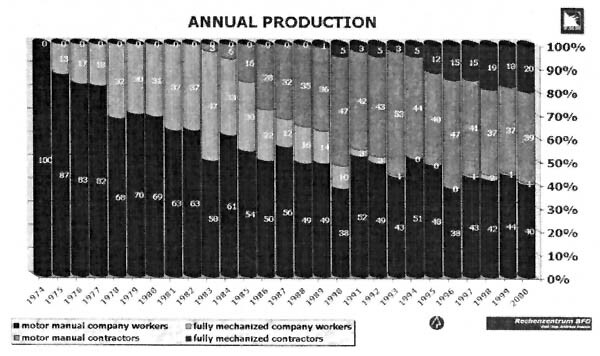 As shown in Figure 2, only a small part of the annual production - 8 percent in the year 2000 - is brought to the road by hand, using gravity over short distances, up to a maximum of 100 m. Another 5 percent is delivered to the roads by other machines, particularly by excavators during road building. Because of steep terrain, the use of skidders and farm tractors is restricted to the forest roads. About one-third of the timber is brought to the road by tractor-mounted winches. This method is not labour intensive; it is comparatively inexpensive and therefore widely used. Slightly less than 50 percent of the total timber production is yarded with a standing skyline system. Downhill yarding is carried out more frequently by the company's own workers and machines (55 percent), than by contractors (see Figure 3). This is because of the use of the company's high-tech cable yarders, such as the “Syncrofalke”, which is particularly suited for downhill transport. Significant developments, concerning the yarding methods, occurred during the last decade (see Figure 3). Thinning operations and all small timber harvesting were completely turned over to contractors and farmers. Other contractors, using yarders with a load capacity of 5 to 6 tonnes, took over the production of heavyweight timber. A further improvement to the yarder's performance resulted from combining the yarder with a hydraulic loader, enabling the yarder-operator to store the different timber assortments within the reach of the loader. Today, in Austria, this combination of yarder and loader is rather prevalent. The cost of production of one cubic metre of round timber has been held at the same level for the past 16 years because of various rationalization measures. The awarding of contracts for labour-intensive logging procedures such as thinning, to commercial enterprises, and the increase in performance/productivity of cable yarders, were crucial factors here. In 1963 the first European mobile cable yarder, with a tiltable steelspar - the “Gösser Seilkran” - was developed in the enterprise's mechanical workshop (see Photo 2). 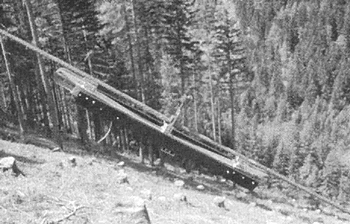 Only one year later a special carriage followed which enabled downhill logging towards the yarder on the forest road. A mobile yarder equipped with hydraulic power transmission and a loading capacity of 5 to 6 tonnes, the “Hydrokran”, went into production for the first time in 1972; and in 1983 this yarder's productivity was improved significantly by the application of the electronic “Target and Speed Control”. This new device, and the possibility for the chokerman to operate the yarder by radio-control, has relieved the worker's strain considerably. 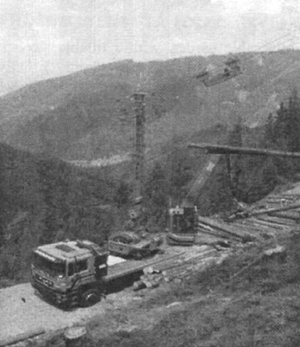 Another, smaller yarder, the “Turmfalke” with a loading capacity of approximately 2.5 tonnes went into production in 1985. Mainline and haulbackline of this yarder were driven by capstan-winches instead of conventional winch drums. The main components of this 2.5 or 3 tonne yarder are two winch drums, each drum with an inner diameter of 1 000 mm, which are mounted on a single shaft and driven by the same hydraulic motor. The mainline drum holds an 11 mm cable of 1 400 or 1 600 m length. The cables are wound onto the drums in opposite directions and their speed is synchronized. Because of the big drum diameter, the speed during haulback of the carriage is more than 8 m per second; the maximum speed with load is 4.5 m per second. The difference in speed and in pulling force of the two cables is less than 18 percent. The “Syncro System” is very efficient and it provides for long life of the cables. The carriage best suited to this type of yarder is the “Sherpa- 3 t”. All Sherpa carriages are equipped with a skyline and a mainline clamp, operated by an automatic radio-control. The carriage can be moved to a better position even while the mainline is hauled out during lateral yarding. Thus, damage to the remaining trees is minimized. Photo 3. A “Syncrofalke” with Sherpa-3t carriage. 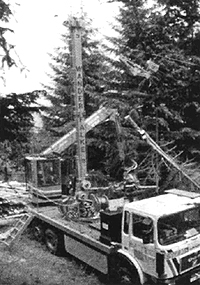 The smaller yarder version, the “Wanderfalke”, developed in 1980 for uphill transport only, was reconstructed in 1998 to meet new higher safety standards. Technical and electronical components are similar to the “Syncrofalke”. It is operated together with the carriage, “Sherpa”. Both the “Syncrofalke” and the “Wanderfalke” may be mounted on a trailer. In this case the use of a second radio-control for the operator is recommended. This should enable the operator to move the timber by the tractor to storage places along the roadside or operate a processor on a separate carrier (see Photo 4), without losing control over the yarding process. Thus, one less worker is required. The opportunity for practical training is a further advantage for the buyer. 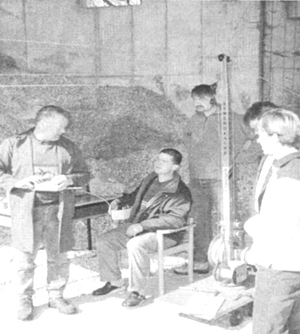 Every sale of a cable yarder is accompanied by at least one week's training in the forestry enterprise. During this training the whole operating team is trained in the installation, operation, safety and maintenance of the respective machines. For machines with electronic controls, various simulators are available. The operation of electronic and radio controls is first practised on a simulator which is equipped with all the operating elements in original size and design. The whole unit is small and can be transported in a small suitcase (see Photo 5). With this simulator all procedures can be practised without incurring the higher costs of the original device. Furthermore, if errors occur during the training, no damage is done to the machine or any other installation. Photo 5. Training in the classroom. Training on the actual machine in the forest does not start until simulator training, including adequate practice, has been completed. The forestry training centre PICHL in Styria is equipped with a model of the cable yarder Syncrofalke, in a scale of 1 : 5, with controls in the original size (see Photo 6). Photo 6. Outdoor training with a model of the “Syncrofalke” cable yarder. With this model, installation and operation can be taught in a very practice-oriented manner. Today, simulators are state-of-the-art for the training of harvester and forwarder drivers, and requirements for a cable crane crew are at least as high, if not higher. 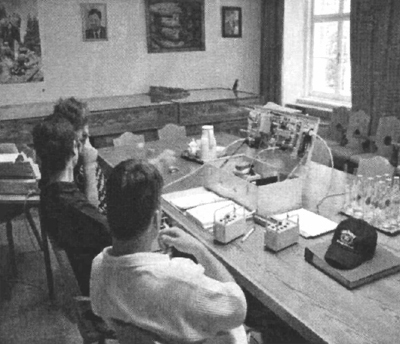 Using modern control techniques, such as automatic target controls and remote radio-controls, simulators and model installations can improve the training considerably and save costs at the same time. The measuring device for cable tension. Memo Force 2000, was developed by Dr. Heinrich Paar, Frohnleiten, Austria, on behalf of the General Accident Insurance (AUVA - Allgemeine Unfallver-sicherungsanstalt). Photo 7. Measuring device for cable tension. A new characteristic of this device is the radio transmission of data. This means that the operator or other persons can remain at a safe distance during the measuring while still being able to follow the measuring results. The measuring results can be read continuously on an evaluation device. This device shows the currently measured value and also the highest value measured during the current procedure. The actual progression of the measurement can be stored and used later for a graphical presentation of the measuring curve. The data stored in this way can be transmitted to a PC or a laptop. With special software, under Windows 95 or 98, this data can be presented graphically. Additional functions allow various forms of presentation and a protocol can be printed. This type of presentation of the forces that emerge during the operation of a cable crane installation is particularly helpful for training. Only the combination of theory and practice in actual examples can demonstrate points of stress to the users of cable devices. This is also highly important for the dimensioning of cables, trees and anchors and is helpful to avoid accidents. In its final development, the MEMO FORCE 2000 will be able to measure up to four cables at the same time and display the data on a screen.